In 1964, when author J. Kirk Casselman applied to Yale College, more than five thousand other secondary school students also applied for admission to one of the 1,300 places in the Yale Class of 1968. Of those applicants, 1,569 were offered admission, for an acceptance ratio of approximately 30 percent. Today, thirty thousand students apply for admission for the same number of places, for an accep… tance ratio of just 7 percent. The drastic change in the college application process results in todays students regularly applying to colleges based solely on name and reputation, without knowledge of a schools profile and character. In the case of Yale, at least, Casselman hopes to correct that lack of knowledge.In and for Yale, Casselman provides a subjectiveand perhaps even impressionisticview of his association with Yale, its institutions and traditions, and the effects they have had on his life. 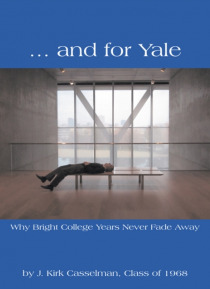 In this memoir, he recalls his undergraduate years at Yale and his more than forty years of involvement with the university as an alumnus recruiting, interviewing, and counseling prospective and current students. This memoir reflects Casselmans passion and lifelong involvement with Yale and helps applicants and future students to understand the nature of the admission process, the college experience, the institution, and the influence it has on its graduates.